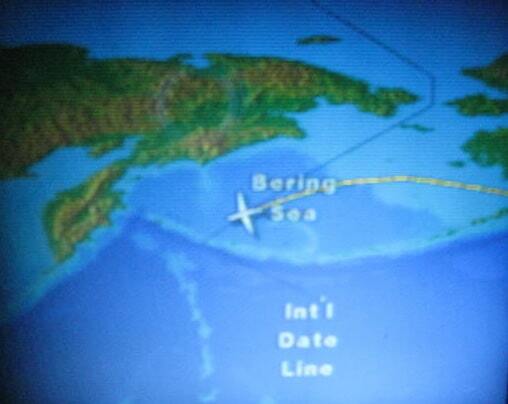 I have just crossed the International Date Line on this arduous journey. I’ve been craning my neck, looking out the window, trying to see the dateline, but it’s too cloudy. Wow! I wish I could have 24-hour-long airplane journeys every day! And lucky me! This one will now be more like 27 or 28. They had a little problem at San Francisco airport. Just as it was time to board, somebody at the airline figured out that the cabin lights and video monitors were not working on our aircraft. Solution Part One: Make an announcement telling all of us to stand around and wait for ten more minutes, at which time they would have more information. Solution Part Two: Repeat that announcement every ten minutes for the next three hours. They did eventually come up with an ingenious solution. My flight – flight 569 to Hong Kong – was scheduled to depart from gate 97. Flight 857 to Beijing was scheduled to depart from gate 95. What they did was move flight 857 to gate 94, and move us to gate 95. Meanwhile, flight 900 to Frankfurt, which I think was originally scheduled to depart from gate 94, would now depart from gate 97. You do the Hokey Pokey and you turn yourself around. That’s what it’s all about. Yeah, so anyway, here’s the thing: For reasons known only to the wizards who make airline rules, all of this required not only gate changes, but also — according to rumors circulating at gate 95 — that we swap planes with the Frankfurt flight. The hope was that our original aircraft might be repaired in time for their now-delayed Frankfurt departure. But apparently, you can’t just swap a plane to Hong Kong with a plane to Frankfurt. For reasons of cultural sensitivity, meals on the two flights are different. You can’t serve udon noodles on a flight to Germany, or wienerschnitzel en route to Hong Kong, It violates the Geneva Convention. Solution to that conundrum: Delay both flights more, remove the entire galleys of both airplanes and bring them over to the other plane. So we waited, and the announcements continued – telling us they would soon be announcing a new departure time, and to please wait in the boarding area for further instructions. Also, to allay confusion, it was announced every three minutes for several hours that if you were originally supposed to board at gate 95 to please move to gate 94, and if you were originally supposed to board at gate 94, please go to gate 97, and if you…. What they did not consider mentioning is that swapping the entire galleys between two airplanes takes a lot of time, and it would have been perfectly safe to leave the gate area for a couple of hours and go sit in a happy place, such as the bar. Instead, they kept us in suspense and made us wait at the gate. Now, I’m all for cultural sensitivity. Really I am. But at some point, I started wondering, would it kill a few passengers from Hong Kong – passengers who had already been in the US – to eat some non-Asian food on their flight home? I’m guessing most of them would have been happy to if it would have meant avoiding a two-and-a-half hour delay. The most quizzical part of the ordeal did not come, however, until many hours later. Ninety minutes before landing, we were served dinner. After all that, our culturally-sensitive, Asian-friendly choices were… (drum roll please…) a toasted turkey-and-cheese sandwich… or lasagna.